The name Montreuil (latin: monasteriolum, meaning small monastery or village) was first noted in an 8th century charter, referring to a village around a monastery, situated at the place of the present church. By the Middle Ages, Montreuil had come to occupy a position at the crossroads of royal and religious life, situated as it was between the abbey of Saint Denis (one of the jewels of medieval gothic architecture, which you can still visit in Saint Denis), burial place of the French royalty, and the château of Vincennes, one of the principal residences of the kings of France until the middle of the 17th century (which can still be seen today on the edge of the neighbouring Bois de Vincennes). Viticulture was the primary source of income for the early inhabitants of Montreuil, along with vegetables, fruit, and flowers destined for markets in Paris. Indeed, like the neighbouring commune of Bagnolet, which the ESDC visited last year, Montreuil of the 18th century was very much a market garden for the city of Paris. The 18th also saw the introduction in Montreuil of the cultivation of peaches on trellises along long walls, the famous “murs de pêches” (walls of peaches), which provided the courts of Louis XIV and Louis XVI, in addition to the inhabitants of Paris, with more than 400 varieties of high quality peaches, and which are still in evidence in some areas of the town today. In 1740, Montreuil received a major new economic impulse with the construction of a new, paved road linking the town with the centre of Paris. By this time, a clear division has also emerged of the two distinct areas within the town: Bas (or lower) Montreuil, bordering with Paris to the south-west, and Haut (higher) Montreuil from the north-east to the north-west. The 19th century saw the increasing industrialisation of Montreuil. Gypsum, which had long been a natural resource of the area, was now exploited on an industrial scale, based around several large quarries. Other industries such as chemical production, leather treatment, alcohol distillery and porcelain manufacture also became established in the town. The town expands rapidly from 13 000 inhabitants in 1872 to 32 000 in 1896, with a strong influx of immigrants from the provinces, particularly in Bas-Montreuil, due to the increasing availability of work in the industrial sectors. Agriculture, however, still remained strong at this time (as is witnessed by the two statues of “Industry” and “Agriculture” outside the Mairie today, signifying their co-existence in the history of the town). Towards the end of the 19th century, a strong workers movement began to form in Montreuil around series of political, social and cultural demonstrations and movements. Indeed, a strong communist tradition has been maintained in the town until this day, the present communist mayor, Patrice Bressac, having succeeded former ex-Communist mayor Jean-Pierre Brard, who held the post of mayor for almost 30 years. Montreuil also has a strong creative tradition, particularly with regard to cinematography. In 1876, Emile Renaud invented the “praxinoscope”, for the first time making possible the animation of image, in Montreui. In 1888, the pioneering Georges Méliès transformed his family home in Montreuil into a film studio, and went on to produce some of the greatest works of early cinema (including the legendary “Le Voyage dans la lune” or “Journey to the moon”. The Pathé brothers also created studios at Montreuil in 1904, to be joined by other famous film makers of the day, until the decline of the silent movie with the advent of the “talkies” towards the end of the twenties. Today, Montreuil is a dynamic commune in the Department of Seine-Saint-Denis and the fifth largest town in the Ile de France, with a population of over 103 000. The town is characterized by strong social and ethnic diversity, and also, since the 1980s, by members of creative and artistic communities, together with a number of large-scale social, economic and ecological projects focused on the revitalisation of the area. At least 15% of the “workers” in Montreuil are active in the creative sector. This gives Montreuil the greatest concentration of creative talent in the east of Paris, and the town in the French with the greatest percentage of creative workers per population. For the second time, the United Nations organisations will be represented at the ESDC, as the UNDP and UNHABITAT team together to form a strong Egyptian unit. The NID will represent INDIA for the third time at the ESDC. They have a particularly strong track record in the Challenge, having won the competition in Bondy in 2014, and claiming joint second prize in 2015 in Bondy. New Zealand makes its first appearance at the ESDC, represented by a strong, multi-disciplinary group of students from the Colab / University of Technology from Auckland. A team from various top design schools (ISIA, IED, QUASAR) in Rome return to the ESDC for the third time, after winning the Trophée du Conseil Général de Seine‐Saint‐Denis with a very impressive poetic yet high practical design proposal in last year in Bagnolet. Ravensbourne University of the Arts in London regularly fields a strong design team in the Challenge. They have been competing since 2012, and claimed a very commendable third prize in Bagnolet in 2014. Dutch designers have played as strong role in the ESDC from the very start. They won second prize in 2012 and 2014, and first prize in 2013. Designers from Strate in Sèvres have competed from the very earlier days in the Challenge, claiming first prize in Amsterdam in 2010,and returning in the very next year to Pantin to claim the title once more, in a mixed team with Les Gobelins. This year, the ESDC has been very fortunate to find a special creative space for our atelier work: ICI Montreuil. ICI Montreuil is described as “A factory for Creatives”. In fact, it is a creative space for artists, craftsmen and women, entrepreneurs and start-ups, covering some 1.700 square metres in part of the old Dufour factory (manufacture of electrical material) in Montreuil. The overall space comprises ateliers, coworking space, prototyping machines, and a range of further creative services. 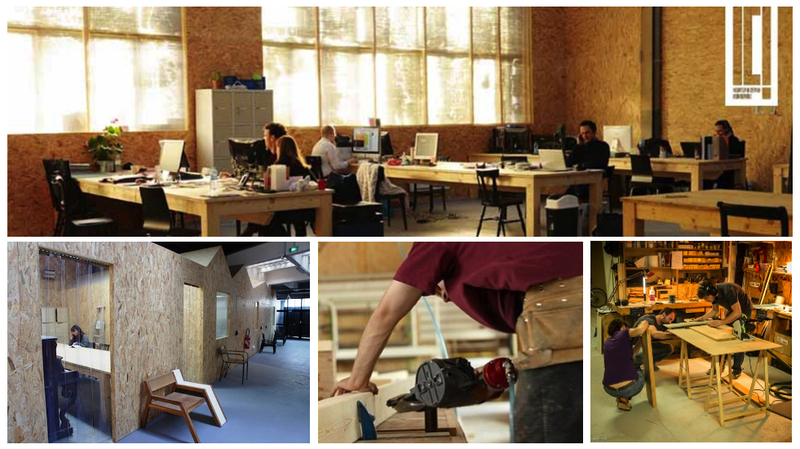 The concept behind ICI Montreuil was to develop a special space for creatives, freelancers, entrepreneurs and independent workers in the creative sector in the area of Montreuil and eastern Paris who did not wish to be isolated or to work in sterile offices, but who were rather looking for an eco-system which would inspire their creative activity. ICI Montreuil is run by the SCIC (Cooperative society for Collective Interest) MADE IN MONTREUIL. Founded in February 2012, MADE IN MONTREUIL has fifteen members, including entrepreneurs, artistes and the Town Hall of Montreuil. His mission is to help its users to development their economic activity and to offer employment for those in difficulty. Of all the districts within Seine-Saint-Denis in the eastern suburbs of Paris, which we have visited with the ESDC to date, the commune of Montreuil displays the greatest degree of “mixité” – a mixture of old French residential and industrial architecture, new apartment blocks, private and social housing, large parks and green areas, commercial and rural (agriculture, horticulture) development. The commune comprises several districts, each of which has its own identity. 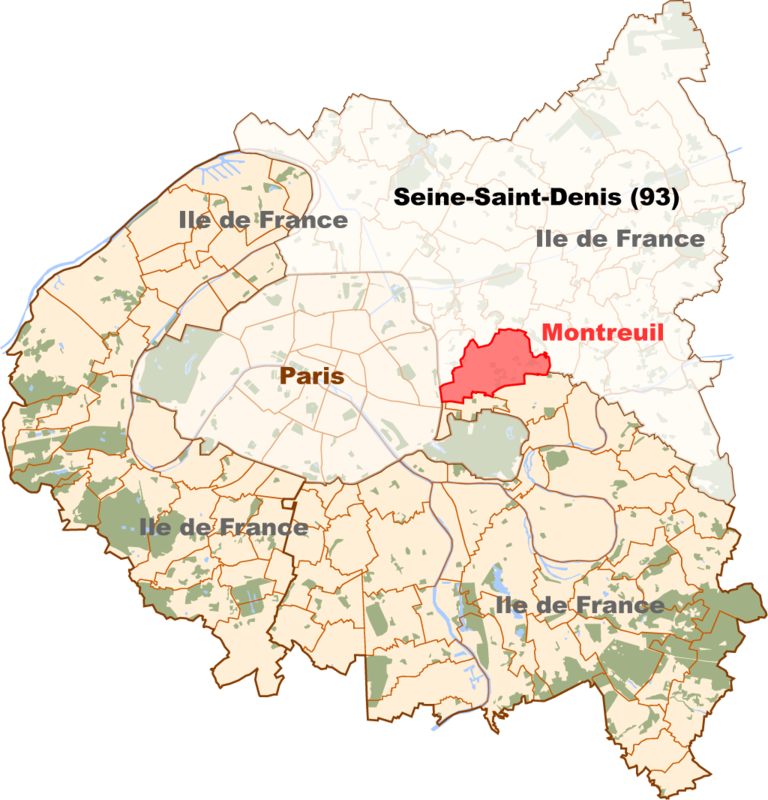 There is a marked difference between Bas (Lower) Montreuil and Haut (Higher) Montreuil. Bas Montreuil borders with the 20th arrondissement of Paris – therefore an attractive, slightly cheaper alternative to living in the city itself – and hosts several large-scale corporations and national organisations (UbiSoft, international banks, CGT, the trade union organisation). There is much attractive renovated housing in the area, and old factories, which have been renovated by modern enterprises. Nevertheless, the area still contains many old areas, in need of renovation, particularly to the north of the “rue de Paris”. Two contrasting target areas have been selected for the ESDC. 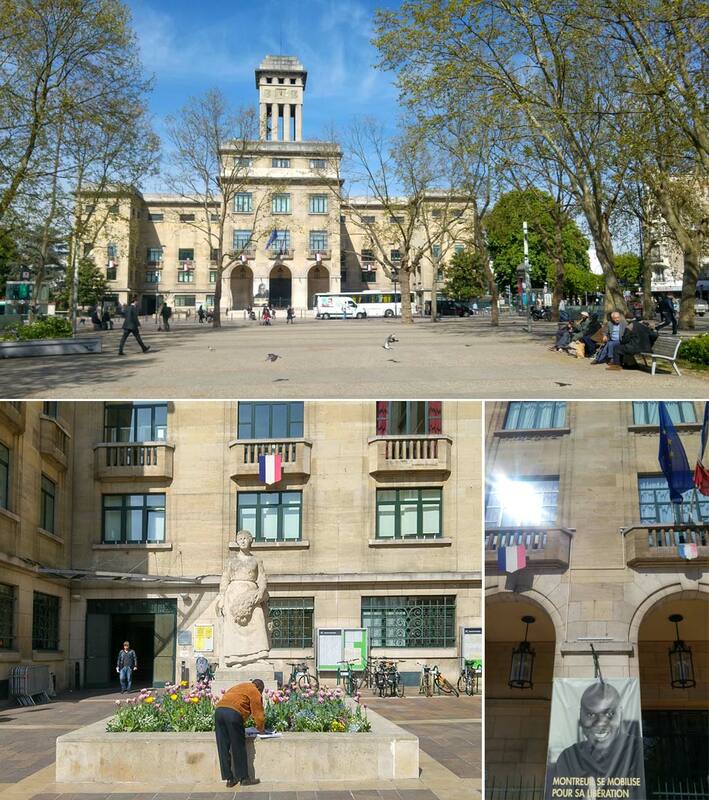 The Mairie has identified both these areas as being in urgent need of revitalisation; studies are in progress to analyse the needs of the areas, and develop urban solutions which meet the needs for improved quality of life together with economic, social and cultural progress. The ESDC teams have the opportunity to propose their innovative solutions for realization in these areas. The large square at the Croix de Chavaux is in a very central location in Montreuil between the “gateway” to Paris (Porte de Montreuil) and the Mairie (Town Hall) and at the intersection of a major arterial road (route départementalend several other local roads. The area is a mixture of 19th and 20th century housing, a commercial centre, a mixture of diverse ethnic restaurants and shops, and a large, covered market, which attracts a large number of residents on several days of the week. The area at around the Croix de Chavaux is in urgent need of development: more thought must be given to the requirements of pedestrians rather than cars, and the available space must be redesigned to meet more “people-centred” aspirations and needs. The “Les Ruffins” area comprises mainly new apartment blocks, together with some older residential buildings, in the east of Montreuil, and on the edge of the attractive “Parc Montreau”. The area also contains high performance sports facilities, a new ecological swimming pool, and several higher education facilities. A market takes places regularly during the week on the edge of the park. The extension of the T1 tram, connecting Montreuil to Saint-Denis is presently being constructed. The terminal stop of the extension will be at Les Ruffins in the area of the present market. Particularly in this context, but also with regard to the quality of life in general, there is a perceived need for proposals for development on a social and cultural in the Les Ruffins. Money will also be made available for the development of citizens’ initiatives for projects with a high degree of quality and potential. High priority will also be given to sustainable solutions with a high level of ecological quality. For the duration of the ESDC in Montreuil, we are very fortunate in having working space in ICI Montreuil, a converted old factory which now hosts a FabLab, ateliers for such professional activities as iron work, woodwork, textile design and sculpting, other spaces for digital start-ups and an exhibition hall. 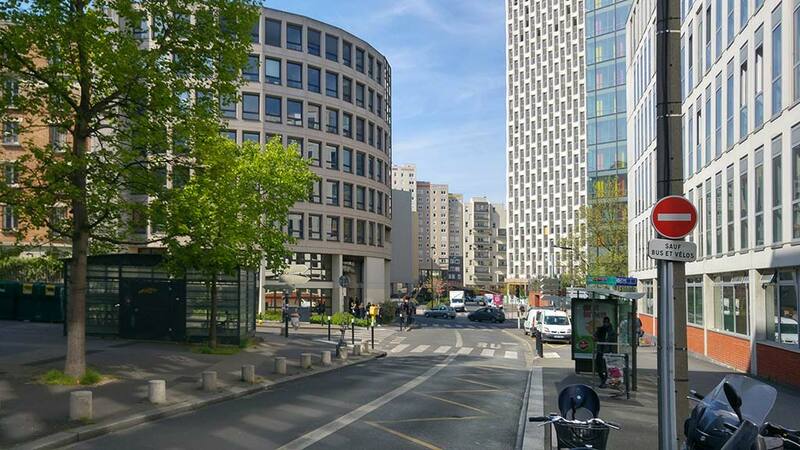 ICI Montreuil is well located for us, as it near the Croix Chavaux and the Mairie, and close to the no. 9 metro line, which goes directly into Paris. As in each year, the ESDC is very actively supported by the Futur en Seine team, and Ouafae Benslimane, representing the départment of Seine-Saint-Denis. This year, the ESDC is also fortunate in receiving very active and collaborative support from Monsieur Ibrahim Dufriche, deputy mayor and the elected representative of the people of Montreuil, responsible for innovation, social economy, digital development and ecology, assisted by Monsieur Yves Miramon. – 5.30pm: Meeting at the Mairie with representatives of Montreuil and the target design areas; Opening of the ESDC 2016 by the Mayor of Montreuil; Cocktail. – Further opportunity to visit target design areas. – 4pm Public presentation of the teams’ design proposals, together with the evaluation by the jury, in the main hall of the Mairie. At 3pm on Monday, 6th June, all the participating teams of the ESDC 2016 met at the Montreuil Mairie before boarding a coach to tour the town, visiting particular key locations, including the target design areas of Croix de Chavaux and Les Ruffins. The group was accompanied by Ouafae Benslimane from Seine-Saint-Denis, Yves Miramont and Gaylord Lechequer, responsible for the urban development of the town, who provided excellent background information on the history and development plans for the town throughout the visit. The guided tour was followed by a meeting at the Mairie with representatives of Montreuil and the target design areas, including local community managers and entrepreneurs. This meeting was accompanied by an excellent presentation of the key areas of Croix de Chavaux and Les Ruffins, and present urban planning perspective, by Medy Sajai from the town hall’s urban planning office. Ibrahim Dufriche-Soilihi, deputy mayor responsible for economic development, then officially opened the Challenge. The opening was followed by a cocktail, where the ESDC participants and local representatives had the opportunity to exchange ideas, and to make appointments for later in the week. The evening ended with a walk from the Mairie to ICI-Montreuil, where the participants had the opportunity to view the work-space, and to talk with Wandrille Heusse, who would be responsible for the hosting arrangements for the coming days. 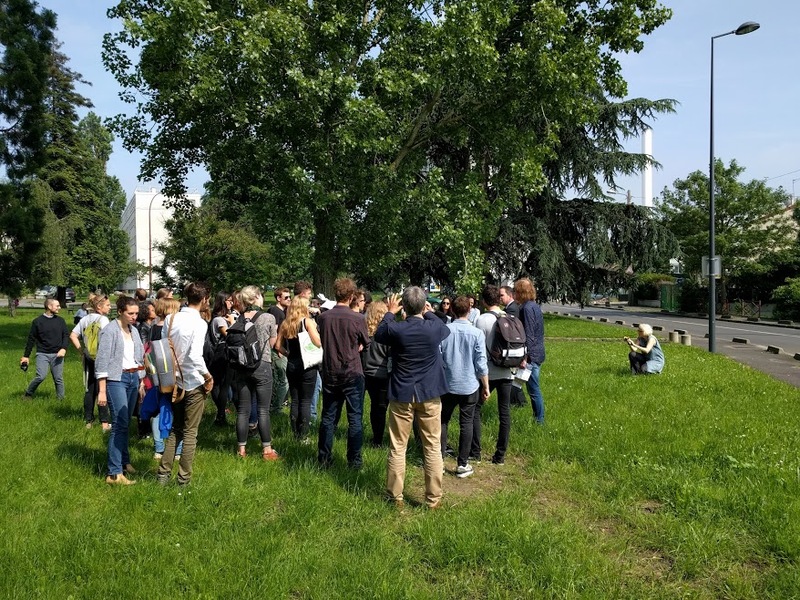 On the morning of Tuesday, 7th June, the teams took the opportunity to visit the target design sites once more to learn more about the areas and for discussions with local residents and community managers. Many of the teams visited both sites in the course of the morning, although most were beginning to focus on one site: either Croix de Chavaux or Les Ruffins. 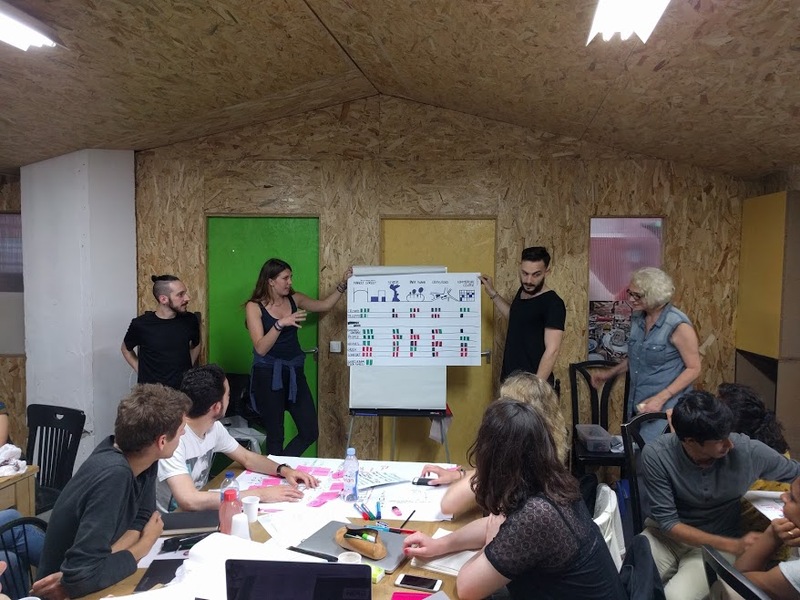 After the morning on site, the teams returned to ICI-Montreuil for 1pm in order to begin the brainstorming exercises, starting with the Value Ladder. The participants and mentors then moved on to the Mental / Emotional Mapping exercise. During the third day of the Challenge, teams continued their brainstorming and conceptual development of their solutions. Several teams began work on their eventual presentations. It was also noticeable that teams were determined to include the ideas and feedback of residents as much as possible into their solutions, and, even at this stage in the design process, they went back out “on to the streets” to sound out opinions and exchange ideas with the locals. 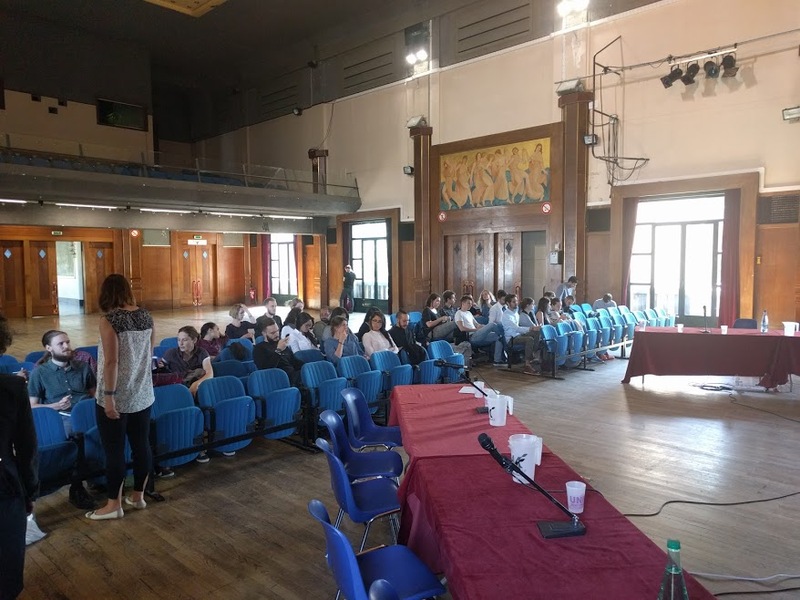 On the final development day of the ESDC, teams worked hard on their final presentations until mid-afternoon, when they left ICI-Montreuil for the last time and made their way to the Mairie of Montreuil for the presentations to the jury. Fabrique en Montreuil is a movement that visualises and nurtures the growing co-creation culture of Montreuil. For a truly human-centred approach, we opened conversations with local community organisations and residents of Montreuil. We found that residents repeatedly pointed that they genuinely enjoyed the area because it did not commonly undergo major changes. To respect this lifestyle, it was important for us not to replicate a solution from another city, and rather build ideas that address local needs with solidarity. Our site visits and insights showed that the Market, located on the West side of Croix de Chavaux, is a cultural centre with high interaction. While the Pedestrian Walkway, on the East side, is an area with great potential for further growth and development. The current crossroads, which lies in between, is a busy hub of traffic and intersections, which not only interrupts a natural flow between the two areas, but also lacks pedestrian guidance – causing ongoing accidents, traffic, and confusion. 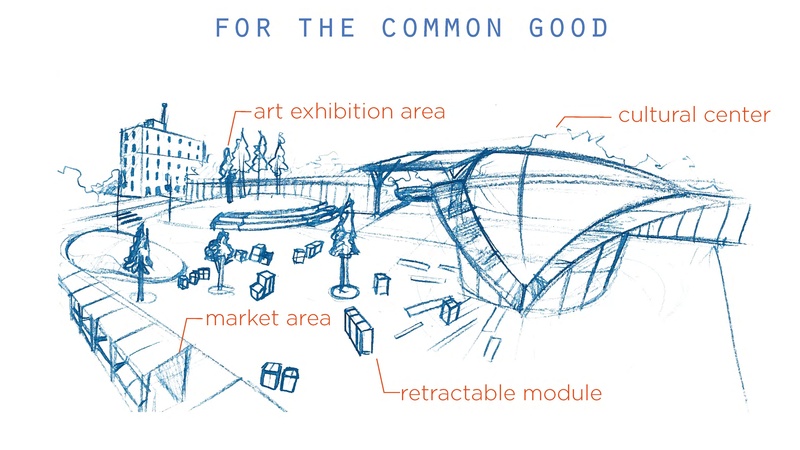 We propose facilitating safety and interconnectedness through visual sidewalk guides inspired by the local artist culture, while linking areas of high interactivity with a cohesive visual identity, such as through reflecting the existing roof structure of the Market to the Pedestrian Walkway on the opposite side. We learned that residents of Montreuil have an active say in which city-funded projects achieve implementation through a voting system. Taking inspiration from this democratic approach, the community would vote on an artist to hand paint his or her submitted pattern on designated spaces in the areas of high interaction. The remaining walkways, which merge from and guide to these designated areas, would welcome the people of Montreuil to contribute to continuing the painting of the artist’s pattern. Thus connecting major areas while encapsulating the very essence of co-creation. These paintings are a start to a conversation that connects people and spaces. Envisioning the future, this artist pattern can act as a flag, a symbol, a representation that appears on labels of local products, and spaces that also incorporate co-creation. 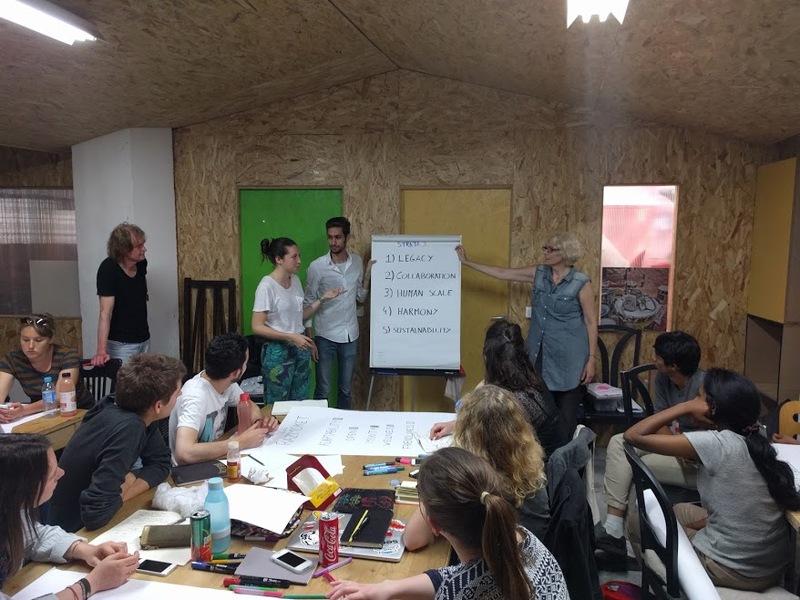 It is a way to visualise where participation occurs – thinking both on a micro and a macro level – to show that the people of Montreuil actively contribute to its development. 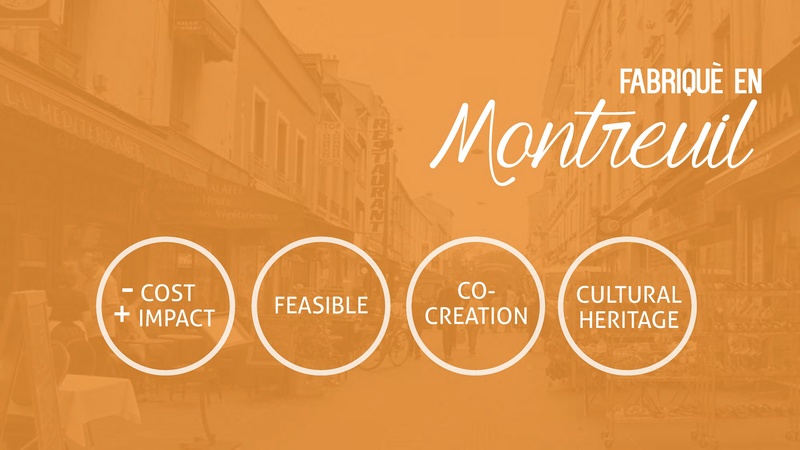 We propose that growing this mindset and respect for the streets could help sustain the city of Montreuil in a holistic way. We saw so much potential to create a space for everyone, a space that can bring together the 101 nationalities of Montreuil, a space for people to be inspired, share their ideas, and to engage together. We see the square as a space for the voice of Montreuil, an emotional thermometer. 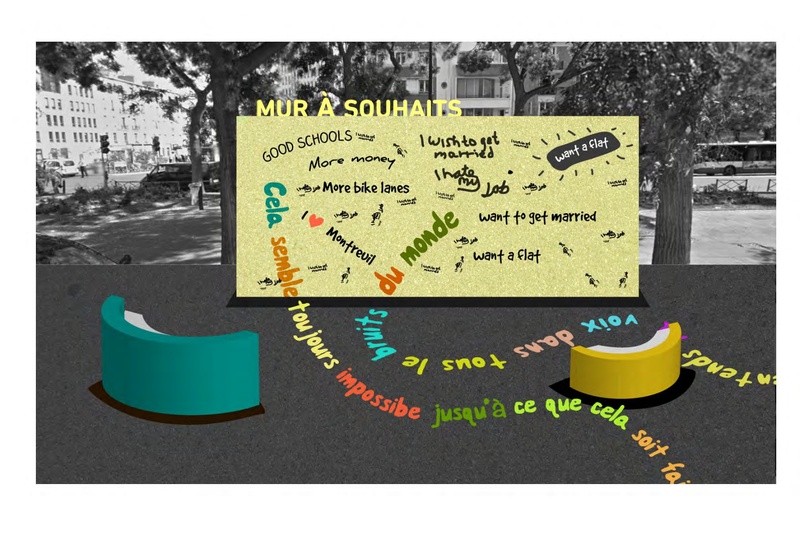 We took the idea of the Mur a peches and appropriated it into a Mur a souhaite, a wall where residents can write their hopes, dreams, ideas, and feelings. A wall to express. The wall also serves to break down barriers by creating a mode of communication with the city. We know that typically public meetings are typically attended by the well to do, but the mur a souhaite is an open, approachable space for everyone to express their wishes This place is also the pulse of the city, where le department and ville de Montreuil can come to understand what the residents are wishing and hoping for. And it is only the beginning, because the mur de souhaite can also be in ruffins, le mairie, Vincennes. And for inspiration, we have quotes from all over the world. For example, the quote by Martin Luther King Jr “Our lives begin to end the day we become silent about things that matter,” and everything that matters is on the wall. While the mur a souhaite is at the center of the space we see a multi directional flow of movement throughout the square, with two other key spaces. One place that these quotes will take you, if you choose to follow them is a stage which will showcase the creative industries that live and breathe in Montreuil – we see this as multi-purpose space. People will come here to show off a little dance, watch someone juggle, or hear an inspirational talk. The idea is that you are in the middle of idea cloud encouraging you to just to BE. Another direction you can go is towards the play space- it is not a play space for kids but a play space for everyone because play is something we all need and it is through play that we innovate and ideas are generated. It also fosters the character of Montreuil as its design is the city logo. Our goal here was to focus on the social aspect of the croix, through the mur a souhaite we created a place for people to gravitate towards, where they can come together to engage, interact, and ideate”. neighborhood on the outskirts of Paris, Montreuil, in particular Place Jacques Duclos, in Croix de Chavaux. The project tackles the issue of “regeneration” by implementing minimum land management, just making a parterre on which will host the most important functions of urban life in Montreuil: relax, sports and crossings. This space is conceived as a “breathing organism” as people according to their offset determine a flux that is reflected on the graphic of the square and on the street lighting that through smart sensors varies its intensity. 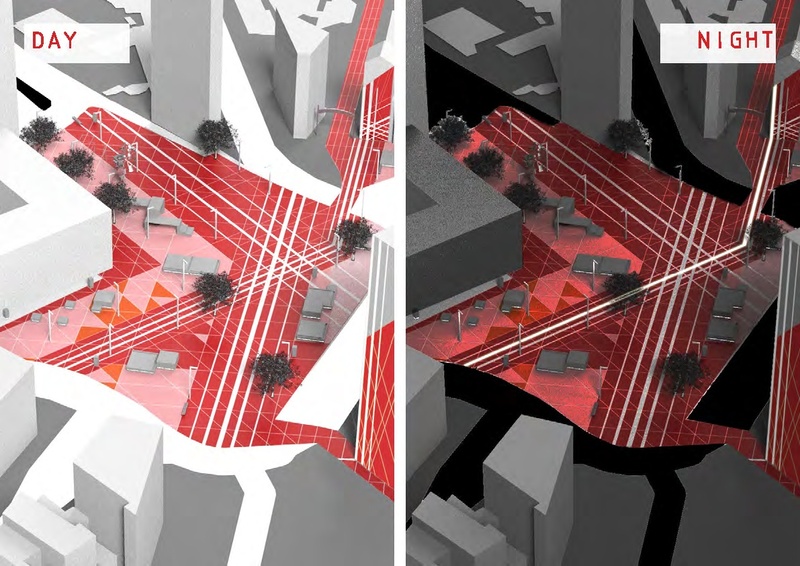 The concept behind is a waterfall of red color, as if a paint bucket was overthrown on the square: the result is a an impactful and new image for Montreal. One more thing is to insert around “white canvas”, blank spaces to be filled by local artists or common people, so that in the making and changing of the public space there is the imprint of the locals. In our imaginary this project in Croix de Chavaux is just the beginning and can be implemented and spread (as a river of color) through the entire city. We explored how to bring life to les Ruffins, a place of transition situated in Haut Montreuil, next to Parc Montreau. It is used once per week for a market, and occasionally by community groups. There’s a tramway on the horizon but the project keeps getting pushed back; so in the meantime the space is left empty… waiting. And yet it is right next to one of the most beautiful, historical parks. In the words of the locals, the park is the heart of the community. But it is closed off, blocked by a fence, disconnected from the space right next door. The transition between the two spaces is stark, abrupt. There is just one small entry point in the fence. This leaves the vacant area without a central space for the local people, and without an identity. Removing the fence may help, but what the space needs is a plan for the in-between, the ‘change’ time. Drawing inspiration from the city of Christchurch, and how locals there responded to losing the heart of the city by building temporary spaces, we developed a plan for an incremental approach to designing the space. It can begin immediately, with local artists and craftspeople constructing temporary objects for the space. These objects would be moveable, allowing the public to explore how they would like to use the space. More importantly, it begins to give the space an identity, and lets the locals know that something is happening and they can be involved. Extending this concept further, we also designed a more permanent infrastructure to allow the space to be flexible and adaptable in the long term. We proposed a network of mounting points that can be planted in the ground. This provides an exciting infrastructure for artists, markets, and other users of the space. Artists gain access to power, sensor data, and light for use in a variety of ways. 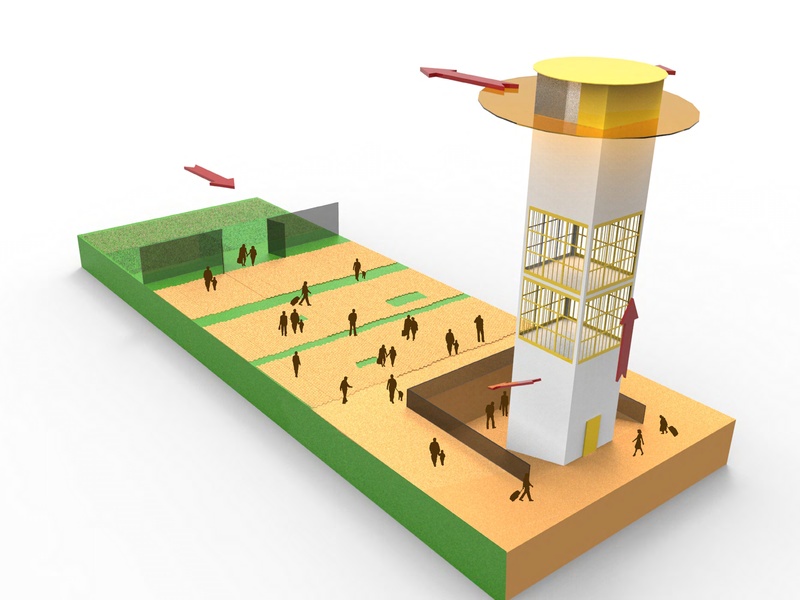 Markets can use the points to gain access to power or erect temporary shelters. Visitors to the space can move seating around to sit together. The networked nature of the points also gives the possibility of things like artistic data visualisations, or could be used to inform future developments of the space. All together, this solution creates an adaptable, modular space that is flexible to community needs and breathes life into what will become the heart of les Ruffins. 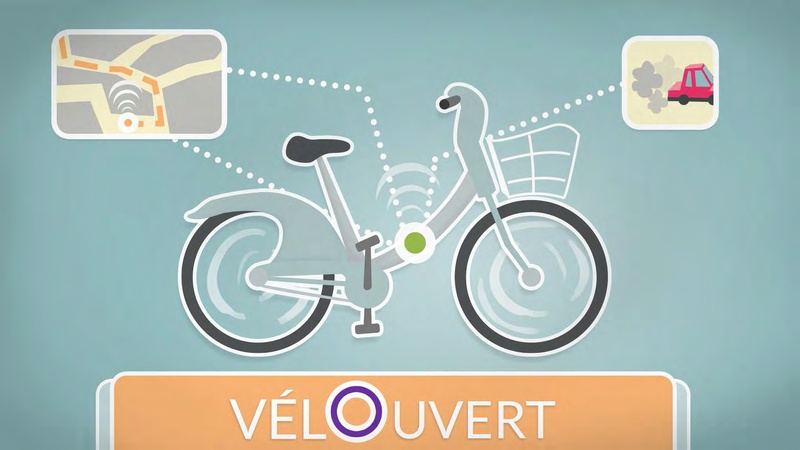 VélOuvert’s goal is to increase the ease of use of the Vélib bicycle rental system while also giving citizens and local governments more knowledge about how people use bicycles in the city of Montreuil. By equipping all the Vélib bicycles with a GPS sensor and a NO2 probe, we can get insights in the routes cyclists actually take and we can measure the quality of air on a street level. Our team aimed to harness the living legacy of Les Ruffins in our redesign of the community center at Place des Ruffins. The proposed solution envisions a multi-storey building with an observatory on the top floor – an opportunity to appreciate Haut Montreuil, especially Parc Montreau – with directions to visible landmarks, and below the ground floor, a downward-sloping walkway to a permanent outdoor exhibit – a wall that uses the trademark form of the murs â pèches to highlight the demographic diversity that makes the city today. On the floors in-between, we incorporated the growing requirements for the community center: offices and meeting rooms for the Mairie as well as for cultural associations of the area. A key aspect of our design for the future Place des Ruffins – a hub for transport, civic participation, recreation, trade and culture – was the removal of the parking lot and garden patches to create a large open space between the building and the entry to Parc Montreau; a space the Montreuilloise can use freely, for concerts, temporary markets (such as the one that currently comes up twice weekly), or various other community activities. Currently the Croix de Chavaux is a busy, loud and air-polluted place. The streets create small islands, which make it hard to orientate and there are hardly any inviting benches and places. It seems like this place is ruled by cars, there is not enough space and respect for pedestrians. Our goal is to give the Croix de Chavaux back to its people and to reinforce the identity of the centre of Montreuil. We hence decided to rearrange the traffic routes and created an axis for the cars in the south. This intervention calms down the northern part of the Croix the Chavaux. To give this newly generated square a homogeneous surface, we pave it with limestone, the original material from the quarries of Montreuil. In a specific grate, trees are planted and streetlights installed. The most important “tool” of the new Croix de Chavaux is our modul, called “VIVE”. This multi-purpose furniture with its simple form can be placed all over the new square. It is flexible, easy to turn, twist and staple. Due to its flexibility, there is a high diversity of its utilisation, which should address various users. We want everyone to be part of this new square, no matter of age, origin, profession or whatever they identify with. Every one of them should feel welcomed – and the “VIVE” has the potential of adapting to this high diversity. Moreover we want organized activities taking place in the new square. As instance an outdoor cinema, workshops with local artists, street food markets, yoga courses or barbecue evenings. In all these events “VIVE” can be used in different ways, or if not needed it can be stapled aside to free the space. To promote the various events we created an App. This application gives information about “what, who & when” and further gives instructions how to modify the “VIVES” for different purposes. 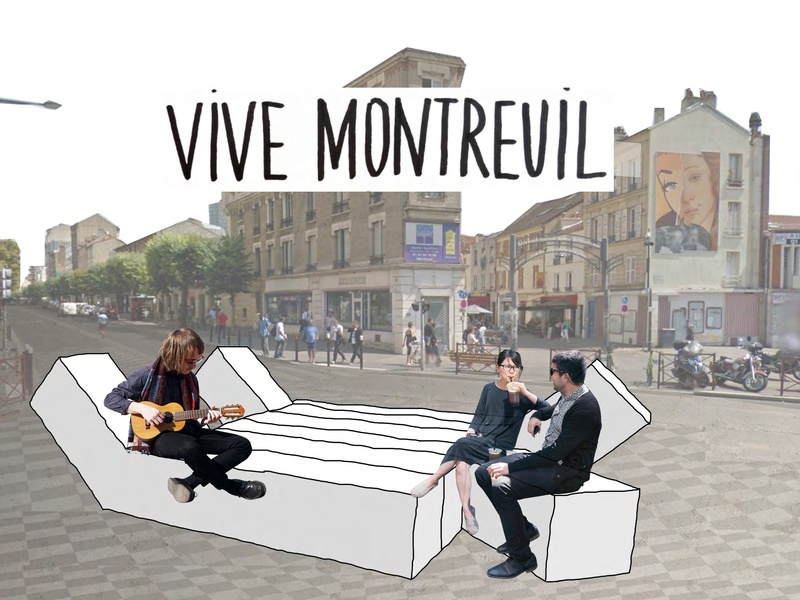 Giving this new square to Montreuil is a great chance to strengthen its identity and to create a lively space where everyone has the chance to be oneself. Starting today, we want to begin and add value to the blooming of a new space of conviviality and culture, while awaiting for the tramway’s opening. The project is divided in four phases: communication, co-creation, construction and usage of the new space. 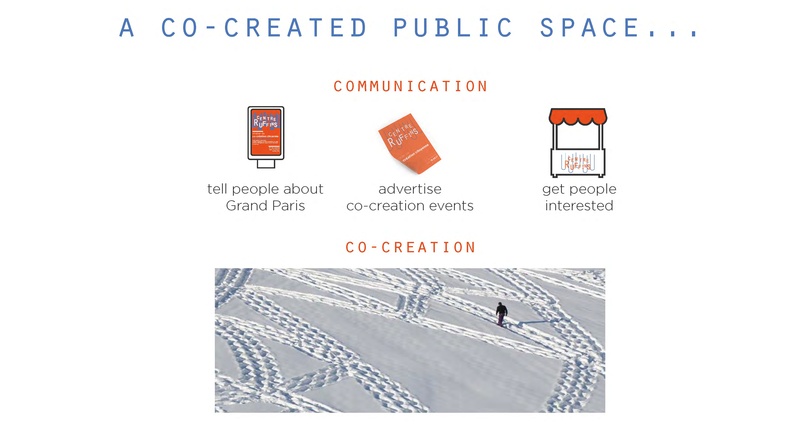 In the communication phase, we really want people to know about the future changes and engage them in our co-creation events. We want to use posters, mailing and a dedicated booth at the market. Then we want to organize on the field co-creation events aiming for people to have fun and spend time together, as a community building their own future. These events are meant to take inputs from locals habits in order to build a custom made space. For one of the event, we would empty the square, cover it with white coating, and then let people freely walk around. By the end of the day we would get the perfect layout to implement pathways. For our other event, we would like to provide people with carton boxes, and let them play around with them. This would allow us to observe their self-organization to shape the layout of the future street furniture. During the construction work, we really want the construction site to remind people of the co-creation phase, thanks to an exhibition on site. By the end of the construction, the square would become a co-created open and cultural place. The park would feel more open with plants connected to the square. In the back of the square would be the new cultural center. The market space would be moved to the other half of the square, to be closer to the tramway and the upcoming shops. Retractable street furniture would be implemented in the market area, so when the market is not held, people would freely pull the modules out of the floor. 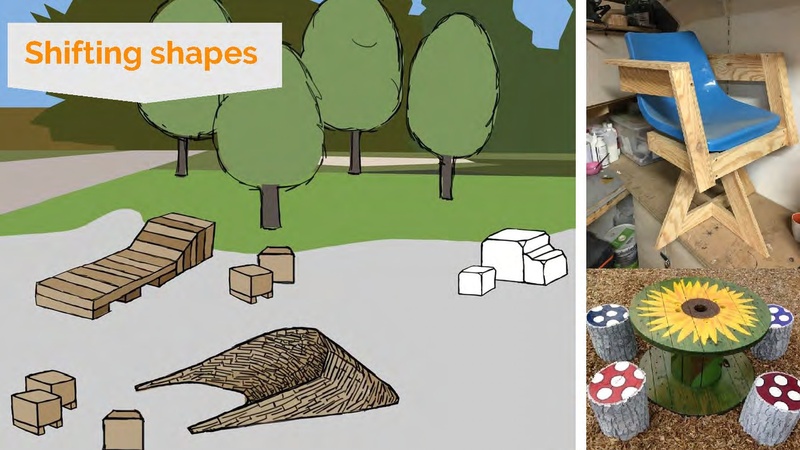 The height of the modules can be adjusted to fit any needs just like in the carton boxes experiment (sit and read, have a table, play, create a bench…). Finally, we would like to implement an outdoor exhibition area for Montreuil plastic artists to showcase their work. 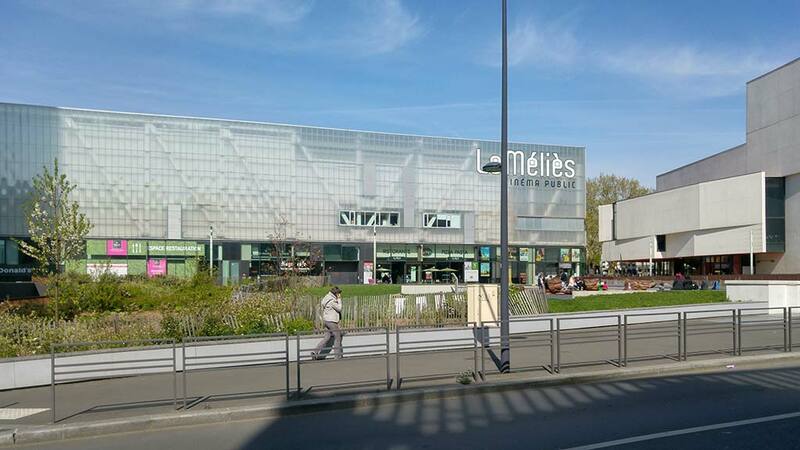 This space would be seen from the tramway, providing Montreuil a great display of its cultural assets. Based on the actual Croix de Chavaux place in Montreuil, our project, Forum, is a pedestrian square where everyone can meet, relax, and feel at home. When we first arrived at the Croix de Chavaux by the underground, the first thing we noticed is how we felt surrounded by cars, on this very small roundabout, like an isolated island where no peace can be found. We started thinking about how to increase the space in the center and where to push the main road that crosses the square without deleting it, and also kept a space on the north side for the bus stops. We moved the extra space from the pavements around to the center, creating a very large square that everyone would cross instead of turning around it. To make Forum more alive, we decided to relocate the Tourist Office at its center, also changing it into a common-room where local associations could meet and discuss about the district’s life. The Tourist Office’s design resonates with a range of urban furniture on which people can sit or find shelter when it’s raining. 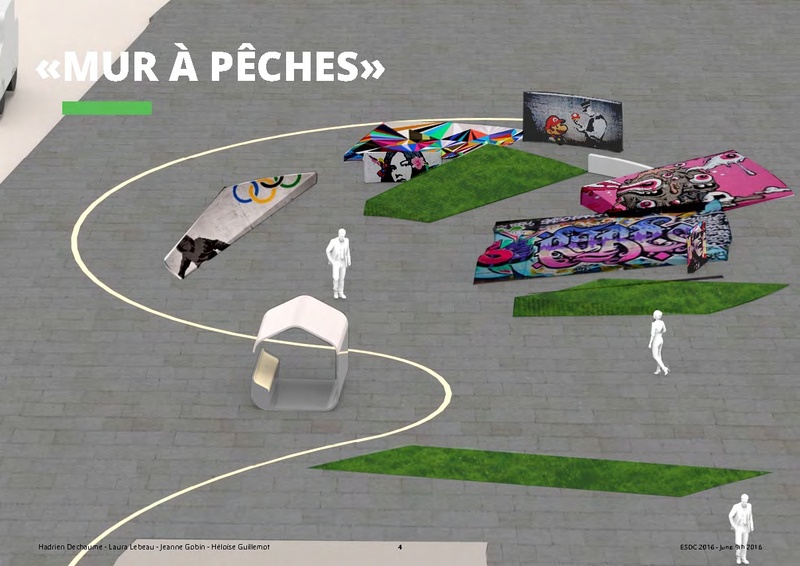 On the east side is the « Mur à Pêches » monument, a reference to Montreuil’s history, that can be modified by anyone, painted, improved, giving back some expression space to the community. Finally, it was important to us that Forum stays a welcoming square at night, so we disposed a path of light on the ground, breaking the stiffness of the city and offering a way to follow to visitors at night. 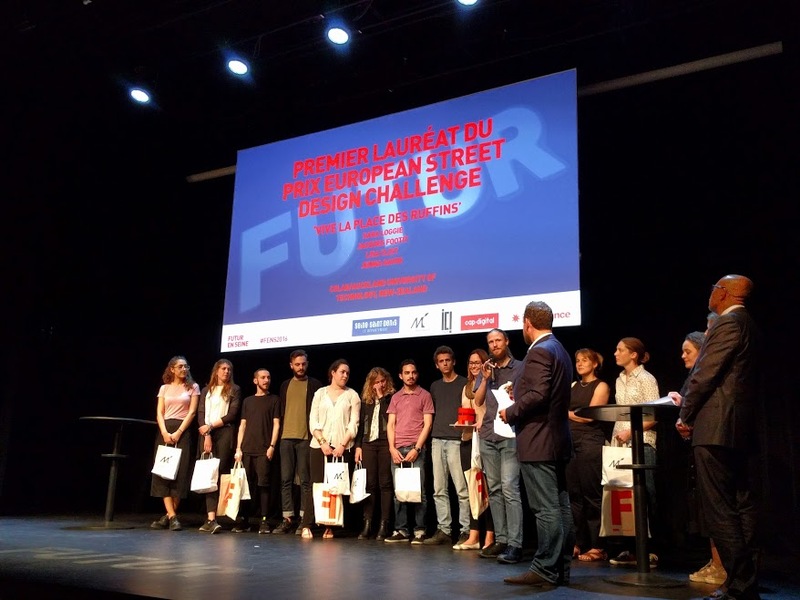 On Friday, 10th June, the European Street Design Challenge culminated in an event, co-organised with the Department of Seine-Saint-Denis, to showcase the urban design solutions, created by the international design teams in Montreuil over the preceding three days. 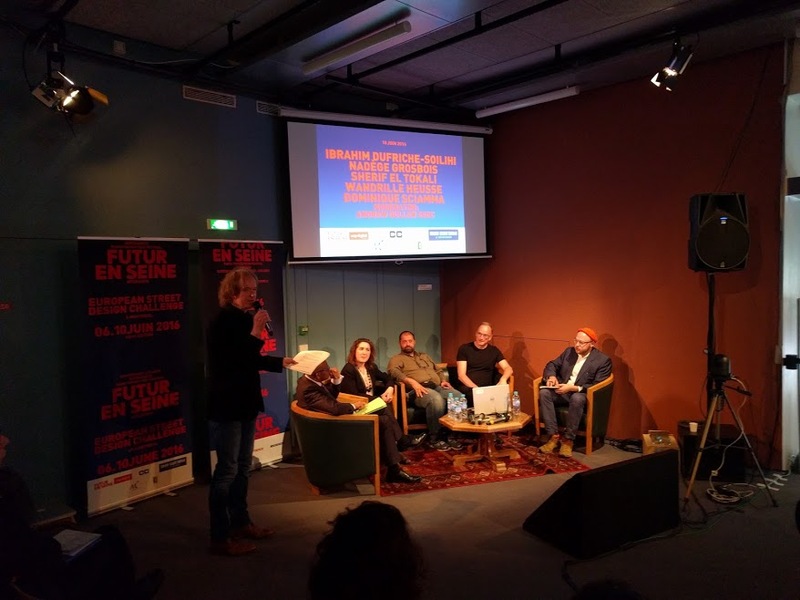 In addition, local and international experts discussed one of the driving concepts behind the creation of the ESDC: Participative Design as a catalyst for Social Entrepreneurship. Design can be a tool for social engagement, innovation and change. 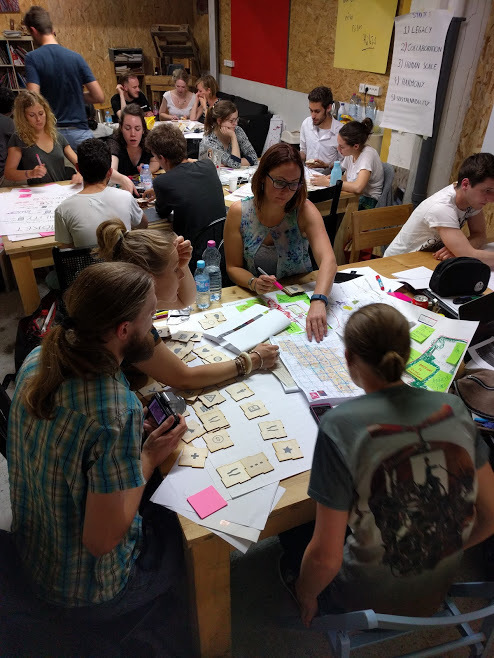 One of the principles of participative design is the belief that individuals or groups with intimate experience and knowledge of an issue can co-design a solution, if they learn how to apply the right design principles, processes and tools with support from design professionals. In this context, local residents can, for example, co-design new, targeted manufacturing or educational facilities to meet the needs of a particular area. Previous “non-designers” are now empowered to apply these newly acquired design skills and tools in different areas of community life, and to develop their entrepreneurial spirit with the awareness that they too can creatively “make a difference” in matters of social design and progress. The event brought together representatives from local government, the UNDP, and professional designers in a round table to discuss effective ways of collaboration in maximizing the use of participative design as a catalyst for social entrepreneurship on a local, national and international level. The award ceremony took place at 5:30 pm on Friday afternoon in the magnificent Carreau du Temple in central Paris. The international jury judged the design propositions on the basis of the following criteria: innovative, scalable, authentic, socially cohesive, feasible, sustainable. And all those other experts and citizens, who gave their valuable time and expertise.